We are always looking for new and exciting ways to capture night shots into the weddings we shoot. We normally do this later in the evening after speeches are said and first dances have occurred, in order for the bride and groom to be more relaxed and have fun while these photos are taken. Rather than just getting the couple to stand in front of a street light, we often try to scope out places that incorporate the venue. The location of a wedding always looks much different later into the day, especially when it comes to lighting and shadows. We have found that Cobble Beach, located near Owen Sound, is one of the best areas to get these nighttime images. One of my favourite features to use at this venue is the bridge by the golf course. For this shot, I wanted to create a frame around the bride and groom while capturing their surroundings as well. 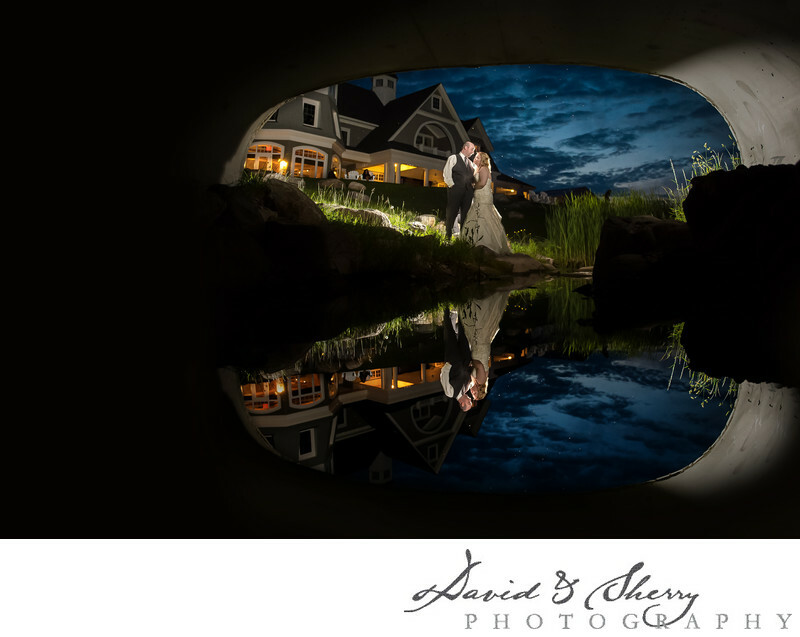 The water under the bridge was still and calm, making a perfect reflection of the couple, the sky, and the Clubhouse. I also chose to get this shot around dusk so that the clouds in the sky and the sunset would still be visible in the background.